Vermont maple syrup highlights this hearty porter's notes of chocolate, caramel, coffee, and vanilla. These boldly designed, premium brewing kits use 100% malt extract, world-class specialty grains, fresh hops, and high quality yeast: that's everything you'll need to create the kind of pints you'll have no problem polishing off. Plus, this dark porter is made with authentic Vermont maple syrup. The finished beer has notes of chocolate, caramel, coffee and vanilla, making it a very drinkable beer with a slight earthy bitterness from the hops. Assembled in Orlando, Florida with US-grown ingredients. 9" H x 16" W x 9" D; 6 lbs. Please note: while the equipment included in the Beer Brewing Kit (listed above) can be reused many times, the ingredients included will brew one gallon. Each Refill Kit contains ingredients to make one additional gallon. GREAT GIFT FOR DARK CRAFT BEER LOVERS!!!!!! I received this for a Fathers Day gift and put it away and forgot about it for a long time. Finally brought it out and made it. I can honestly say I am happy with the results. To me it has a smooth deep slight maple taste which is very pleasant. We are excited to try this out. I got it for my husband for Valentine's Day. The kit comes with everything except for the bottles. We are going to have to watch the videos online to make sure the beer comes out awesome! Great for a gift but requires a lot more time then the description lets on. It takes about three weeks to ferment but the product is worth the wait! Bought this for my husband for Christmas and he loves it! 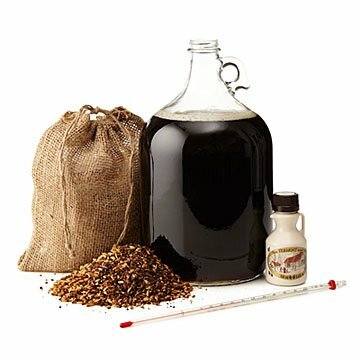 Most brew kits contain plastic bottles and just overall seem cheap. This is a nice kit w glass bottles and good ingredients! I gave it as a gift for my dad who used to make beer when I was younger and he loved it!! About a year or two ago, I got my husband a beer brewing class. The class came with a beer brewing kit. The pieces (sans bottles) you need to make beer. He hasn't had much time to make anything, so I purchased this kit so he can at least get his feet wet. It's a small kit, but he should be able to make a few bottles. The packaging is cute and he will be able to use it as storage.